After their fifth-placed finish last season, Chelsea will feature in the Europa League this year as they look to try and bounce back from their disappointment. The Blues did end the campaign on a high note with their FA Cup success, but naturally the objective for Antonio Conte and his players was to secure a top-four Premier League finish as they fell well short of the standard set the previous year when they won the title. It’s been a battle for Cesc Fabregas to establish himself as a key figure in the Italian tactician’s plans at Stamford Bridge, but he has made 86 appearances over the last two years under his stewardship. Now though, the Spaniard is preparing to make his first appearance in the Europa League, and as seen in the tweet below, he doesn’t sound particularly thrilled by the idea in a little dig at the tournament as he revealed he ‘allowed’ the official Twitter account for the competition to follow him on Twitter after 15 years of keeping them at bay. Further, it appeared as though the Chelsea midfielder, who has impressed with his punditry work at the World Cup with the BBC Sport team this summer, also couldn’t help himself but have a dig back at a Tottenham fan who cheekily suggested he’d be better off joining them for a bench role. 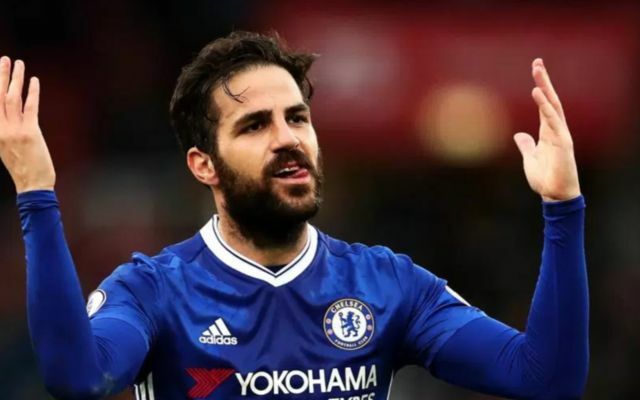 Fabregas replied: “No way mate, cheers”, to put an end to that idea immediately, but it remains to be seen if he can now go on and play a key role in Chelsea enjoying success in Europe and perhaps more importantly, get back in the mix for the Premier League title again next season. No way mate cheers ?